Methylglyoxal-modifications are elevated in the myofilament of human diabetic patients with heart failure. (A) Representative 2-colored dot blot showing methylglyoxal (MG, green), α-tubulin (red), and merge of the myofilament fraction of nonfailing control (NF) samples or diabetes with heart failure samples (dbHF). Below is shown the merge channel for MG (green) and α-tubulin (red) for NF and dilated cardiomyopathy (DCM) left ventricular myofilament samples. (B) Quantification of the MG/tubulin ratio in myofilament fraction of NF (n = 4) versus dbHF (n = 6) and NF (n = 4) versus DCM (n = 4) samples. **P < 0.01 using 2-way ANOVA for disease and blot. (C) Tandem mass spectrometry (MS/MS) spectral counts for total MG-modifications for either NF (black dots) (n = 4) or dbHF (black squares) (n = 5) myofilament samples. **P < 0.01, using unpaired t test. 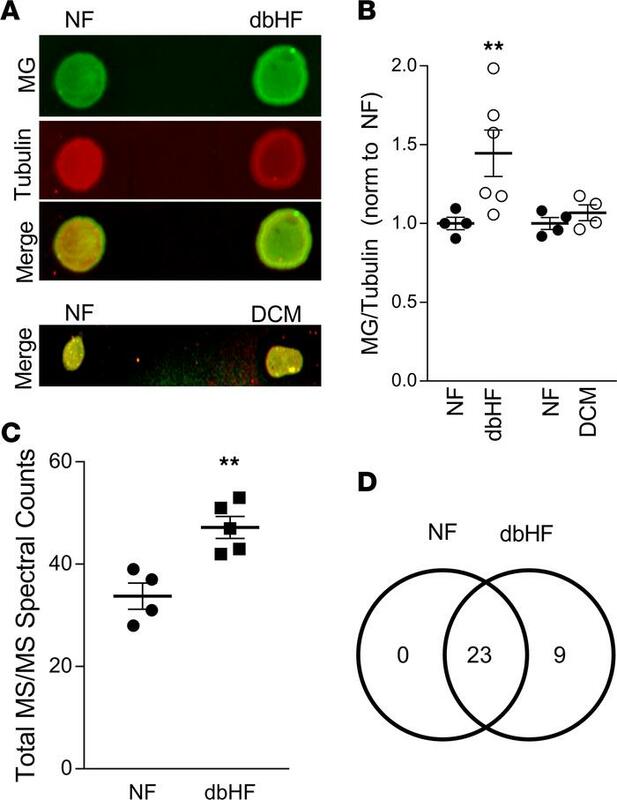 (D) Venn diagram of MG-modifications detected in NF and dbHF samples by MS.